So I was walking out of work today and so happen I was exiting the lobby at the same time as JK Simmons. 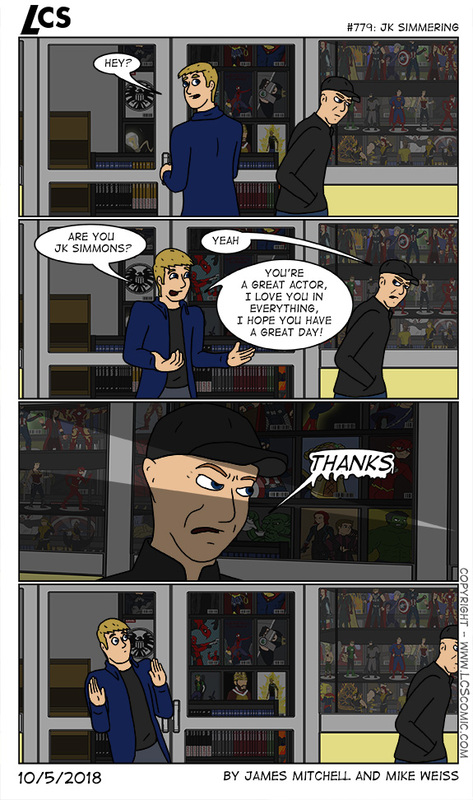 I did about 20 double takes and while I being “that guy” I had to make sure it was him so this comic is pretty much exactly what happened and boy, he was not in the mood to talk to anyone, didn’t even look at me. I don’t blame him, he looked like he was having a terrible day. I could see he was probably just finished traveling and was trying to get a rented apartment all set and the last thing he wants to do is chat with some douche walking by. Still it was really cool and gave me something to draw today, though I wish I could draw him better.